The following arias for voices(s) and piano are sold by Classical on Demand: "Turn!" • "Toys!" • "Stretch!" • "The Child" • "And So We Shall" • "Moon-White Bird" • "Make Them Dance" • "Higher! Brighter" • "Sisters of the Night!" • "This Star in the West" • "Everything’s in Readiness"
While the Elves must perform as traditional opera singers, casting should favor singers with other vocal skills such as jazz improvisation, rap, and/or quasi-percussive choral utterance, as their principal sequence, the toy quartet, will extend as far outside traditional operatic technique as taste and ability will permit. Becoming Santa Claus is performable without chorus. But if a chorus is available, those sequences which will benefit from SATB enrichment will be indicated in the score. Similarly, those segments — particularly the toymaking sequence — which can welcome, but do not require, development through dance will also be marked in the music. Christmas is coming! Heard as a teen, the phrase filled me with dread. Joy, too: still, dread. ‘T’is the season of love! the culture shouted. So: buy things! (I mean here the voice of secular Christmas, the insistent voice: Christian Christmas invites, but doesn’t force, your attention.) I loved—still love—the glittering windows, the rushing, crushing crowds—and those generosities, personal and social, that the holiday both fêtes and fosters. But do those beribboned boxes express love? Or merely mime it? It’s the thought that counts, the cliché promises: just to be there is the gift. But don’t those January VISA bills ask how often we prize presents over presence? In this original story, Claus is a prince of an Elven realm in the far north, son of a conflicted Queen sorceress and a King vanished under mysterious circumstances. No one expects Claus’s father at the boy’s glittering 13th birthday, but his uncles (the Three Kings of Christmas legend) are hoped for; when, called to the crib of a mysterious Child, they send, instead, regrets and gifts. The stung Claus recruits his quartet of hapless Elves to make the most spectacular toys ever created to dazzle the Child and exact a rejected nephew’s revenge. It doesn’t quite turn out that way. Scene One: Evening: mere hours before the extravagant gala planned for the thirteenth birthday of Prince Claus. In the palace of the royal family of Nifland, an Elven realm in the very, very Far North, Ib, the no-nonsense leader of the palace staff, summons her staff: time to prepare the party! But only nervous Yab and rebellious Ob appear; various disasters have beset the other scheduled servants. Ib despairs---so much remains to be done—when Yan appears; more inquisitive than experienced, true, but eager to help. Ib explains that Queen Sophine, regent, sorceress, and mother of Claus, has been planning this event so obsessively that she hasn’t permitted Ib or her team a much-desired day off for over three years. When Yan asks the obvious questions: why is this so important? And where is the King, vanished years ago under mysterious circumstances?—Ib stonewalls, until she is interrupted by the entrance of Queen Sophine herself, who inquires after the Prince. None has seen him. Alone, Queen Sophine tries to lure her recalcitrant son to the party; he balks until she reveals that his three treasured uncles (who happen to be Caspar, Melchior, and Balthazar, the three kings of Christmas legend) have confirmed attending. Prince Claus joins the Queen in awaiting them, but uncle after uncle fails to show up, until at last a Donkey-Messenger arrives to read a letter explaining all three Kings’ absence; a star in the west has summoned them to attend the birth of a mysterious child, so to the Prince they have sent, instead, regrets and gifts. Claus, clearly stung, storms out. Yan, still full of questions, plies the Queen with Champagne until she explains the Prince’s current temperament. His father the King, like his uncles just now, had too often sent the boy presents as substitutes for the father’s presence, until the formerly open-hearted boy turned brittle and grasping; desperate to restore her family, the Queen decided to exile his father for three years, and did so by casting a spell which…did what? Yan doesn’t learn. Prince Claus returns, demanding to learn from the Kings’ letter what gifts his uncles have prepared for this mysterious child; when learning the gifts are symbolic medicines and ointments like myrrh and frankincense—hardly the stuff of a child’s dreams-- Prince Claus proposes that the Elves devise, instead, a sleighful of the most spectacular toys ever made, and then he and the Elves will join his uncles at the Child’s crib to pay tribute their way. The Elves are skeptical: but, lured by the renewed promise of time off, agree. Scene Two: Midmorning the next day: the Elves’ Toyshop, deep in the bowels of the royal palace. Prince Claus demands a review of the gifts each of the four Elves have drafted during the previous night: to his eye, none of them are special enough. “They need to be new!” he urges (threatens?) Back they go to work: the toys improve, but the time is slipping away. Ib warns the Prince that at their current pace, they will never finish the presents in time to reach the child by the predicted time of his birth; Claus brags that he can persuade his mother to use her magic to solve that problem, but Ib isn’t so sure. Prince Claus wheedles his mother to attend the unveiling of the now-completed toys, confident that their glamour will persuade her to step in. The Elves give the presentation their all, but the Queen remains unconvinced of the Prince’s good faith: she decides she won’t stand in his way, but she won’t help, either. Stung, but undeterred, the Prince sets off. Scene Three: Twilight, half the world away: a stable outside of a small, poor town in the desert. Prince Claus and the Elves appear, a trove of wonders in tow. The Elves ask the drowsing Donkey they find (the messenger from the party) to announce the Prince’s arrival. But the Donkey informs them they’re too late: the child and his mother left three days ago. Yan asks them to tell them what happened when the Kings arrived at the manger. Moving as the Donkey’s response is, it doesn’t solve the problem of what to do with a sleigh full of these toys when there’s no one to give them to. The Prince’s solution changes everything. Dallas Opera's Becoming Santa Claus is visually and aurally stunning on a videodisc.… As his own librettist, Adamo renders the story in witty and sometimes fast-paced rhymes — a hybrid, if you will, of Lewis Carroll and Edith Sitwell. The words are decorated with vivid vocalism and a wealth of orchestral color. From the start of the overture, Mark makes clear that, while this is a "family opera" (as marketers like to call them), he refuses to talk down to child audiences. This is sophisticated musical writing, intriguingly scored — and in that respect it's no different from Mark's other work. He never lets the listener grow complacent; he always has a surprise up his sleeve. Like Humperdinck's Hänsel und Gretel, in which there are themes far darker than those explored in many productions, Becoming Santa Claus is not a pièce d'occasion to be performed only when the jingling of sleigh bells perforates the air. No, Becoming Santa Claus is not a festively attired Ring des Nibelungen in which a department-store St. Nicholas and painted-snow North Pole stand in for Wotan and Walhalla, but Adamo produced a score in which the quest for individual purpose that is the soul of the story forms the foundation of the music's structure. The development of thematic material in the music complements the interplay of ideas in the text, the musicality of the composer's libretto meticulously matched with the poetry of his music. To listeners acquainted with Twenty-First-Century opera, the suggestion that a score is accessible to audiences lacking a high tolerance for tuneless droning implies an accusation of banality, but Adamo's easily-absorbed idiom is sophisticated without demanding that the listener possess an above-average appetite for musical modernity. 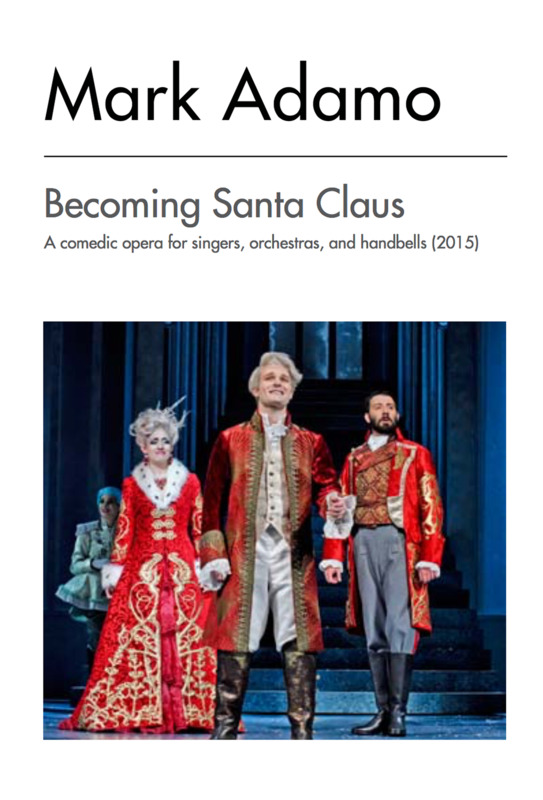 Both the vocal writing and the orchestrations in Becoming Santa Claus exude ingenuity, but the score's complexities never mask the opera's inherent simplicity. The operas of too few contemporary composers exhibit genuine affinity for writing for voices, and one of the greatest accomplishments of Becoming Santa Claus is the adroitness of Adamo's vocal craftsmanship. Even when dizzyingly difficult, the angular vocal lines are singable and memorable — the hallmarks of effective opera whether composed by Mozart, Verdi, Gounod, Wagner, or Adamo. Adamo is remarkably skillful in the way he takes practically every aspect of the modern American celebration of Christmas — toys, the birth of Jesus, parties, toys, "the day off," toys, and a lot more — and weaves them into a story that is coherent, engaging, thought-provoking, and fun. We should also credit the composer/librettist for his refreshingly deep scrutiny of one custom in particular, and it's an examination of which Marcel Mauss would be proud: without undue moralizing, Adamo manages to throw light on disconcerting aspects of the practice of gift-giving, and he does so without resorting to the phrase "true meaning of Christmas." The libretto, sparkling and clever despite its verbosity, is the work of a superior wordsmith. The music is appealing, inventive, and varied, drawing energy from assorted pop idioms while maintaining a consistent aesthetic. The bustling, sassy music for the elves regularly delights, as do the overture and intermezzi. The music for Prince Claus and Queen Sophine is more dramatic and sometimes more lyrical in character… The best lyrical moment is reserved for the Donkey, whose recollection of the manger scene is simple and moving. Becoming Santa Claus is entirely the product of Adamo’s vivid imagination: the plot of the opera was his idea, he penned the opulent, rhyming lyrics, and he imaged the wild musical score that drifts from Broadway to rap to Handelian bel canto to twentieth-century atonality and back again. If it sounds crazy, well, musically it most definitely is. In the orchestra pit there is a piano tuned a quarter tone down next to one that is not, a harpsichord plucking along with baroque intensity, and some massively complicated passagework for woodwinds and brass to navigate. It seems as if Adamo, aware of the sugary fluff that often characterizes holiday music, made a conscious decision to flex his compositional muscles here. This may be a Christmas opera, but you won’t find any carols or schmaltzy waltzes here. It's a rare gift to find a truly novel Christmas story that doesn't feel like a Hallmark or Lifetime movie-of-the-week. But Adamo, who also wrote the music and libretto, has penned an original holiday tale that connects the Santa Claus legend with the Nativity story with such simplicity that it makes you wonder why it hasn't been done before... A surprisingly fresh and welcome holiday treat. For theatergoers and fans of ballet and choral music, this time of year is synonymous with Christmas Carols, Nutcrackers and Messiahs, yet opera lovers are essentially left with only the dark and twisted fairy tale Hansel and Gretel or Menotti’s Amahl and the Night Visitors. Adamo’s glittery new holiday opera fills that void, and its broad appeal stretches far beyond the nativity story and the lore surrounding Santa Claus. With a brilliant creative team and cast of performers, this poignant human drama should appeal to children and adults, queer and straight audiences alike.